Step out of the city life by going to Teijo national park and Bellevue Beach. You'll visit kid-friendly attractions like Arboretum Mustila and Tulliniemi Nature Path. 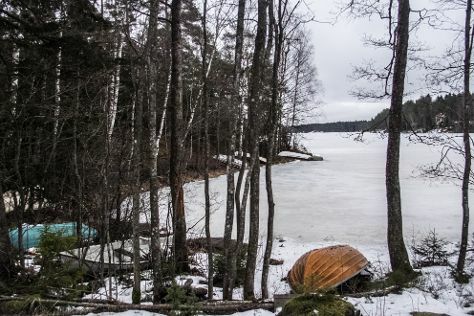 Get out of town with these interesting Helsinki side-trips: Ekenas Archipelago National Park (in Raseborg), Santalahti Nature Trail (in Kotka) and Stromforsin ruukki (in Ruotsinpyhtaa). Spend the 30th (Tue) exploring nature at Valkmusa National Park. Next up on the itinerary: steep yourself in history at Seurasaari Island and Open-Air Museum, admire the masterpieces at Museum of Contemporary Art Kiasma, relax and rejuvenate at some of the top local wellness centers, and test your team's savvy at popular escape rooms. To find more things to do, maps, traveler tips, and tourist information, refer to the Helsinki route planner. If you are flying in from United States, the closest major airport is Helsinki Vantaa Airport. April in Helsinki sees daily highs of 47°F and lows of 32°F at night. Finish up your sightseeing early on the 30th (Tue) so you can travel to Inari. Kick off your visit on the 1st (Wed): experience rural life at Reindeer Farm Petri Mattus, then examine the collection at Siida, and then stroll through Juutua Nature Trail. Here are some ideas for day two: get great views at Lemmenjoki National Park. For more things to do, where to stay, and more tourist information, go to the Inari road trip website . Traveling by combination of flight and shuttle from Helsinki to Inari takes 4 hours. Alternatively, you can drive; or do a combination of train and bus. Traveling from Helsinki in April, things will get little chillier in Inari: highs are around 37°F and lows about 22°F. Wrap up your sightseeing on the 2nd (Thu) early enough to travel to Muonio. Muonio is a municipality of Finland.The town is located in far northern Finland above the Arctic Circle on the country's western border, within the area of the former Lappi province. On the 3rd (Fri), relax in the rural setting at Ounaskievari Reindeer Farm and then head outdoors with Seven Fells Up. Get ready for a full day of sightseeing on the next day: ski along the peaceful trails at Torassieppi Reindeer Farm & Cottages, don't miss a visit to Giewont Husky Adventures, and then wander the streets of Ounasjoki - River for activities. To find where to stay, photos, other places to visit, and more tourist information, refer to the Muonio trip itinerary maker app . The Route module can help you plan travel from Inari to Muonio. May in Muonio sees daily highs of 46°F and lows of 32°F at night. Wrap up your sightseeing by early afternoon on the 5th (Sun) to allow enough time to travel to Rovaniemi. Start off your visit on the 5th (Sun): snap pictures at Lumberjack's Candle Bridge. On the next day, stop by Your Piece Of Finland, hit the slopes at Ounasvaaran Hiihtokeskus Oy, then examine the collection at Christmas House Santa, and finally take in the architecture and atmosphere at Rovaniemi Church. To see reviews, maps, photos, and more tourist information, read our Rovaniemi trip itinerary maker . The Route module can help you plan travel from Muonio to Rovaniemi. In May, daytime highs in Rovaniemi are 51°F, while nighttime lows are 37°F. Wrap up your sightseeing by early afternoon on the 8th (Wed) to allow time for the bus ride to Kuusamo. Kuusamo is a town and municipality in Finland. Kick off your visit on the 8th (Wed): stop by Riipisen Wild Game and Souvenier Shop and then admire the masterpieces at Hannu Hautala Nature Photography Centre. On the 9th (Thu), you'll have a packed day of sightseeing: ski along the peaceful trails at Ski Resort Suomutunturi. To find ratings, traveler tips, maps, and tourist information, you can read our Kuusamo road trip planning site . You can take a bus from Rovaniemi to Kuusamo in 2.5 hours. Alternatively, you can drive. In May, daily temperatures in Kuusamo can reach 50°F, while at night they dip to 34°F. Wrap up your sightseeing on the 10th (Fri) to allow time to travel to Muonio. On the 11th (Sat), take a memorable tour with Tours, stop by Akaslompolo Sportshop, and then get engrossed in the history at Samiland. On the 12th (Sun), you'll have a packed day of sightseeing: head outdoors with Scandinavian Adventures, see the interesting displays at The Sarestoniemi Museum, and then contemplate the long history of Keimioniemi Fishing Cabins. For more things to do and other tourist information, refer to the Muonio road trip site . The Route module can help you plan travel from Kuusamo to Muonio. Wrap up your sightseeing by early afternoon on the 13th (Mon) to allow enough time to travel back home.